Working on Version 2.99. Why not 3.00? Because new AI will be required due to a massive data reorganization, and I'll try my hand at it once the data is done. Reorganize + replaced 7 5 unnecessary sprites. No more fire hadoukens, and each level should have its own unique sprite. * Punch stuns in 2 hits instead of 3(like Dennis), Davis speed, but reduced range & poor in-range(similar to Freeze?). * Tweaks to grabbing to make it possible to change direction while grabbing. Throw_lying_man will use the standard throwing animation that most characters have; this is to enable the possibility of throw combos. * Blink's data mechanics tweaked; D^/vJ uses a ball to catch Steiner instead of relying on dvz. No more direct air blink unless combo'd from Super or DvA. Nerf to mana cost. * Add D^A; blink upward and fire hadoukens straight down. This is intended for punishing dash attacks. * Hadouken maximum charge is now 6 instead of 7. All are energy-based(no more burning) and generally hit once only, and significantly nerfed to a reasonable level, although 1 frame faster to fire after charging. * The original level 7 Hadouken is now a Hell Move. * Air Hadoukens will now automatically fire twice on pressing A once, but each projectile will knockdown immediately instead of stun and overall nerfed. * Remove the walk & drink mechanic because its awkward and character drinks too slow. Drinking will now work like original LF2, except hit_j can also be used to cancel. * D>A now only has 4 ball variants. Charge stages are 6 instead of 7. The variants are: stun, normal, anti-guard, state 3006(Henry arrow). * D^A now fires two anti-air hadoukens. Due to a flaw in LF2's throw mechanic, I've made these hadoukens have no bdy, only itr. Note the video is OUTDATED; it should explode on hit, have shadows + different trajectories/speed/power. * While grabbing, >A throws forward while J throws upward (-25mp). This is mostly a combo enabler. * DvA nerfed significantly; can only chain into an L2 D>A. It is done. Only thing left to v3.00 is AI. Nave's AI still works, although obviously it wouldn't be able to use the character to its full potential. Overall Steiner has been nerfed(less damage, less melee reach, more MP expensive), plus one new move. 1. Punch - 2 hits to stun like Dennis, average speed, Jack's reach. 2. 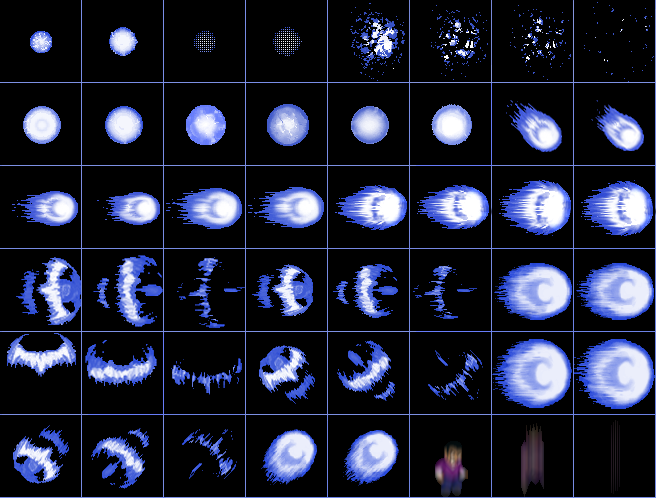 Jump Attack - Always shoots 2 fireballs(new sprites). Can still be used even if you have 0 mana. 3. >>J<A - Air Stun ball is now separate from Jump Attack. 4. Grab - You can now change direction while grabbing. >A is still throw forward. J is to throw upwards (costs mana). 5. DvA - Faster cooldown, but less pushing power. No more wall infinite combo. +A now combos into L2 Hadouken. 6. DxJ - Same teleport as before as I couldn't find a better way to code it, but range & mana cost are nerfed, and can no longer teleport into the air. +J instead combos into DvA. 7. D^A - New anti-air move; in practice its more of a combo-finisher, intended to work with Super or Grab+J. You can use it to hit Julian/Knight/Mark even if they are simply standing in front of you. You cannot punch the anti-air balls to deflect it because it has no bdy - and it has no bdy because having bdy ruins the throw upward combo. 8. Added a secret hell move. Its basically the old L7 Hadouken, except its actually even more powerful relative to the length of a map. 9. D>A - Charge frames 7 -> 6, hadouken variants 7 -> 4. * L1 is stun as usual. * L2 is normal bolt as usual (50dmg 60bdef). * L3 ignores defense and much more damage. At point-blank range, it briefly has state 3006. * L4 behaves very similarly to Henry's D>J arrow, except it breaks defense and can destroy weapons on the floor. You will now automatically fire D>A on reaching the maximum charge. 10. Technical Change - data formatting. I've also managed to squeeze all the stm_ball data into one file, so you only need IDs 930 & 931 now, no need 932. And perhaps give him a different sound than Davis's when he fires the L4 hadouken. Just record yourself and edit with Audacity. (01-21-2016, 07:14 PM)A-Man Wrote: And perhaps give him a different sound than Davis's when he fires the L4 hadouken. Just record yourself and edit with Audacity. Sound is desynced in the video. And here's an older, deeper attempt. If its good I'll update the download. it does sound alright to me (although imo a deeper voice would fit him better, but since its your representative char i guess your original voice is fine ), but don't you have any way to record at a better quality? Nope, I don't have a better mic, so this is the best quality I can get. As for deeper, well there's attempt #1 in my editted post. I didn't think it fit to make him sound that deep, so I re-recorded and sped it up. I liked the second one more, and I think it fits very well. The first has an annoying change in pitch in the last portion of it, similar to what autotuning does to voices in modern music. Alright, I changed it to the 2nd video(attempt #1 steinervoicetest)'s voice. If anyone doesn't like the voice, can always just copy 095.wav and paste over steinerroar.wav. As usual download in first post, updated without changing version number. * Re-buffed punch itrs slightly. Dash attack's itr size & duration is nerfed however. * Walk & Run very slightly faster, jump very slightly higher. * D>A MP cost is now 60+15+20+25(x3)=170 instead of 75+15(x5)=150. Air Hadoukens now cost 60mp. * L3 & L4 D>A nerfed damage from 75/80 to 60 for both. Combined with the mp change above, this move is now less abusable in stage mode and closer to Henry's D>J (50dmg 175mp). Full charge isn't really usable in a duel anyway. * DvA MP cost 60->50. Dmg 45->55. This is because a certain JA D>JJ (<)A combo costs too much mana for too little damage. * You can now hold (<) after performing DvAA to shoot the L2 ball backwards instead of charging. This is to make the above combo more doable at the cost of not being able to charge the attack, but frankly you wouldn't want to charge it in most cases. 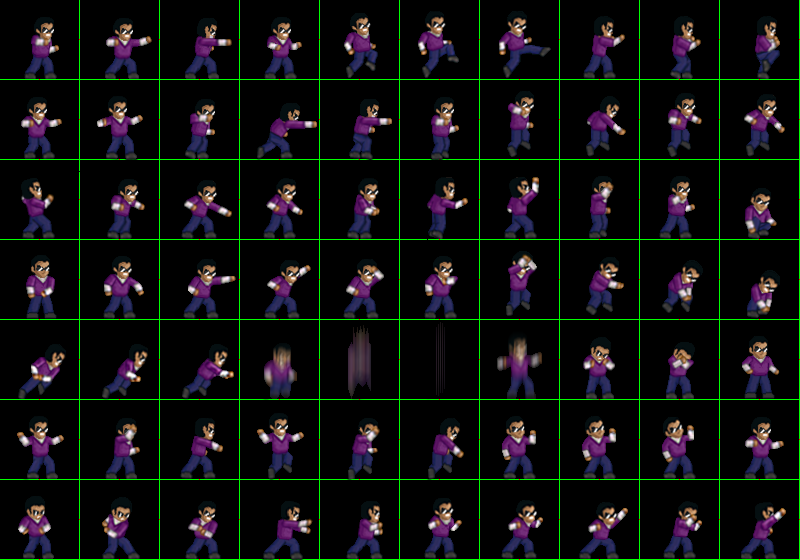 * The timing for pressing J to burst after a teleport is now more lenient by adding a new exclusive "standing" frame. * Hell move nerfed; now does 135 direct damage + 4 distance damage instead of 80 + 12 distance damage. Also costs 50->70HP to perform and fixed a bug with running out of mana. Voice changed. Updated download link again since no one downloaded anyway. Too lazy to change version number. Sent an email to @Blue Phoenix to update mainsite download. Still using Nave's AI and I couldn't get him to use the new moves, but its been updated slightly; more aggressive and will use the DvA D>A combo very liberally (sometimes even J A D>J DvA D>A). He can still clear stage 1 from time to time! In fact he seems more consistent than before. There's a bug at 5:57 because stop heavy weapon running frame used next: 999 instead of next: 12. I've fixed that since this video got uploaded. ...so I guess this is it until I learn how to code custom AI. as i said in my quality chars thread, his fully charged hadouken is a bit overpowered, mainly because the charging time is very short, so steiner desen't spend much time nor mana charging it. also, after getting to 33% health, you could spam it all the time, and you're almost unkillable, as you could teleport away if your enemy gets too close. with this tactic, i fought against 4 julians on crazy, and killed three of them(last one had about 1/4 hp remaining) the ai uses then same tactic too, as he fights normally until he gets low on health, and then he escapes and spams level 4 hadoukens. what i suggest is increasing the time and/or mana cost of the charging, so that he doesen't spam them(again, they're as strong as julian big balls). (09-08-2016, 03:35 PM)yuseiatlas Wrote: as i said in my quality chars thread, his fully charged hadouken is a bit overpowered, mainly because the charging time is very short, so steiner desen't spend much time nor mana charging it. also, after getting to 33% health, you could spam it all the time, and you're almost unkillable, as you could teleport away if your enemy gets too close. with this tactic, i fought against 4 julians on crazy, and killed three of them(last one had about 1/4 hp remaining) the ai uses then same tactic too, as he fights normally until he gets low on health, and then he escapes and spams level 4 hadoukens. what i suggest is increasing the time and/or mana cost of the charging, so that he doesen't spam them(again, they're as strong as julian big balls). The biggest issue with Steiner's big hadouken(which actually costs 170mp total) is the way the charging system works. It works by exploiting a trick with holding back(for hit_d) and negative MP (which is also why charging doesn't work with F6). However, using -mp also has a huge problem where if the character runs out of MP, will continue to go into the hit_d frame indefinitely. That means Steiner will always be able to spam hadoukens as long as he has 59mp(the initial cost of D>A). And because I changed Steiner to always release once fully charged instead of allowing you to delay by holding back, he will always shoot instead of being forced to continue charging when low on MP. I did this because it felt buggy to get stuck in -mp and using hit_a to release when already fully charged doesn't work because when your MP is negative, your inputs are disabled. I also didn't really think his fully charged D>A was overpowered because D>A's charging time is actually long enough to be easily punished in a PvP context & you can just roll/jump over it, but I suppose I got obsessed with Steiner being good at clearing stage mode mobs & dealing with enemy projectiles, plus I didn't like the idea of L4 hadouken being blockable like Henry's D>A/J or John's D^A. * Remove D^A and the Grab+J throw. They don't really add to the character. * Re-add D>JJ to teleport into the air. D>JA will work as teleport+burst. Nerf the teleport invulnerability a bit. * Make his hell move accessible from D>A (only when fully charged and you need to hit an input) instead of from DJA. * Add separate D>A frames for comboing from DvA; otherwise his DvA (D)>A combos would cost too much MP. * D>A overall cost more MP(initial cost 60->90) & take longer to charge(by adding a useless "buffer" frame between charge levels) once charged past L2, as suggested. L4 dmg can be a bit lower too from 70 to 60-65 maybe. Went back to x3 hits to stun with punch, but retain x2 hits to break defense (mostly to deal with Knights). Stats have been nerfed, but light weapon throwing is more accurate and Steiner actually jumps/dashes better than before. Some wpoint locations have been changed, for better and for worse with regards to a certain weapon-disappear-on-edge bug. Grab+J Upthrow and D^A Anti-Air Hadoukens have been removed; they don't add to the character. Can no longer blink towards the air, not even from Super. Its simply way too overpowered; too mp-efficient & unavoidable regardless if you flip or not. Can no longer use J+A to run attack. This double input method is not good with characters who potentially reach negative mana, plus run attack is pretty overpowered to be used without running. Run Attack is slightly stronger but less movement range and can block attacks during startup. Dash Attack damage is mostly transferred to the 1st hit, 2nd hit is arest instead of vrest. Can no longer roll from all landing frames. However, Steiner can still roll in the opposite direction(even with F6 enabled!) when landing from state 6(flipping or air hadoukens) & along z-axis. Can blink while carrying a heavy weapon and will now blink together with grab victim. Blink D^J/DvJ no longer requires holding ^/v to use. DJA is a new no-movement more-invincibility blink. Burst is stronger but slightly slower & costs more mana and combos into weaker shorter-ranged hadoukens. Burning Hadouken makes a return here. No more infinite Burst combos, but you can still chain them quite a bit like Woody. Hadouken now has effectively double the initial mana cost, matching Freeze's D>A. This should make hadoukens(including charged ones) a lot less spammable. Charging system is also a lot more precise. Charged hadoukens rebalanced; weaker in general. The new Level 4 charge can pierce multiple enemies/weapons, but a very high chance of being destroyed if punched or hit by a weak projectile or thrown weapon, very much like Freeze's icicles. Added +A input for Level 5, which is the old Level 4 with some buffs to make it very similar to Julian's Soul Bomb. Unlike the previous charges, this one costs a LOT of mana and you NEED to have the minimum mana required and be in Level 4. Hell Move input changed. It no longer costs HP to use, but it requires you to reach Level 4 and have full MP while less than 100hp. It should also no longer double damage from both the ball & the explosion. tl;dr - I nerfed him(mostly his projectile/teleport game) and reworked his data so that he feels better to use. I'm now working on a new id AI for Steiner; I don't think he should stay using Nave's AI forever if I can make my own. Current time: 04-24-2019, 04:28 AM Powered By MyBB, © 2002-2019 MyBB Group. Theme created by Silverthorn.